You are here: Event Listings / / / Atomic – Jukebox hits all night long! 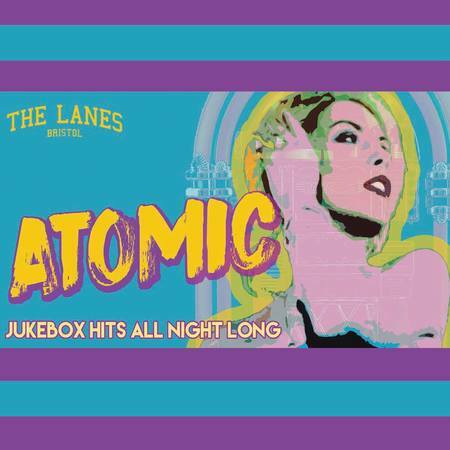 Atomic – Jukebox hits all night long! Resident DJs playing the very best of jukebox hits from 50s to presents keeping your feet tapping all night long! Every 1st and 3rd Thursday of the month FREE ENTRY. * Shots – Sambucca, Tequila, Sourz, Fireball £2. * Vodka, Rum, Gin, Whiskey with mixer. £2.50 single / £4.00 dbl (50p surcharge for red bull). * Sailor Jerry / Mixer – sgl £3.00 / dbl £4.50. * Orchard Pig Reveller Cider Can (440ml) £3.00. * Adnams Dry Hopped Lager Can (330ml) £3.00. * Adnams Bitter Can (500ml) £3.00. Venue Details: The Lanes Bristol, 22 Nelson street, Bristol BS1 2LE, United Kingdom.